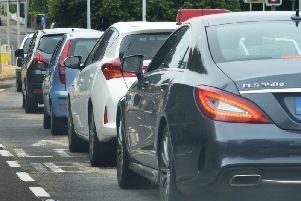 A major six vehicle accident closed the A1M southbound between Yaxley and Peterborough this evening, Wednesday April 27. The air ambulance landed at the scene and reports say up to a dozen emergency vehicles including three fire units, police and ambulance are at the scene. The accident closed the road southbound and the northbound carriageway was also shut to allow the air ambulance to land. The crash involved six vehicles, including a Peugeot which has left the road, hit a tree and come to rest on its roof. A white van, minibus, white Ford Fiesta, and white Mercedes saloon have also been damaged in the crash. One person, a passenger in a car near the accident said: “All lanes are at a standstill. It looks very serious indeed. Drivers should avoid the area at all costs. There are a large number of emergency vehicles and the air ambulance has arrived. Highways England said the accident happened between junctions 17 and 16 at Norman Cross. It described the incident as “extremely serious”. The northbound and southbound carriageway were reopened following investigation work and recovery at around 9.30pm.